Buses and trams to the University campus and city centre are available from stops nearby. There are frequent services throughout the day to both locations and to Hillsborough and Crookes. In the evenings services are a little less frequent but do operate until late. Whatever your interests Sheffield has many excellent facilities including lively nightlife - with many pubs and nightclubs, restaurants, cinemas, theatres, galleries, museums and concert venues. The sporting facilities include international venues such as Pond's Forge, with its Olympic sized pool, Don Valley stadium, the Hallam FM Arena (home of the Sheffield Steelers Ice Hockey team) and the Ski Village. 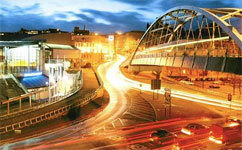 There are several shopping areas within the city including the city centre and the Meadowhall shopping mall. The Peak District National Park, accessible by rail and road is just outside the city and offers wonderful countryside with excellent walking. Within a few minute's walk or drive from Walkley House you can find a wide range of shops and leisure facilities to serve your needs. Nearby there is a choice of supermarkets, and other shops, from which most requirements can be purchased, and Hillsborough Leisure Centre for sports facilities.